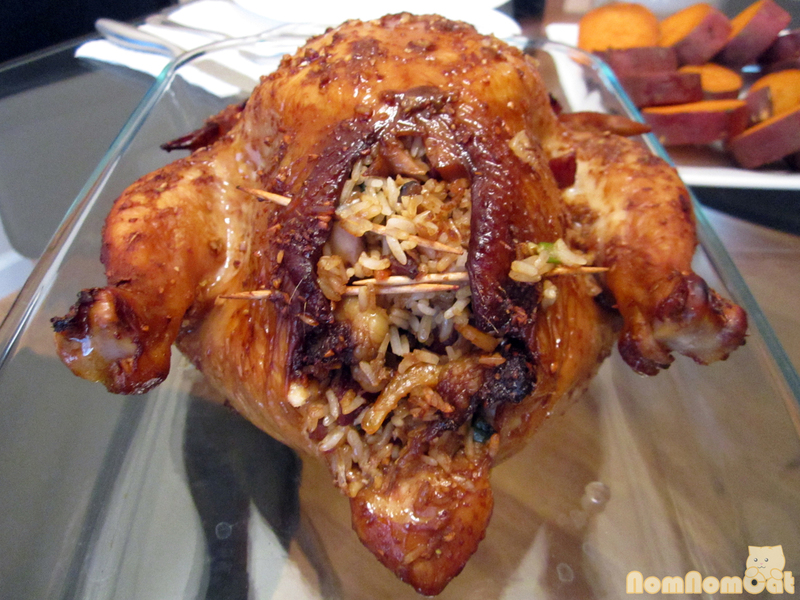 Voila — roast chicken with sticky rice stuffing! All of the credit goes to my mom, and to Martin Yan for the inspiration. After a few years of following the recipe, then tweaking and tweaking again, she finally settled on a fantastic marinade this year that blew me away. It was really that good. No, I’m not biased at all – why would you say that? 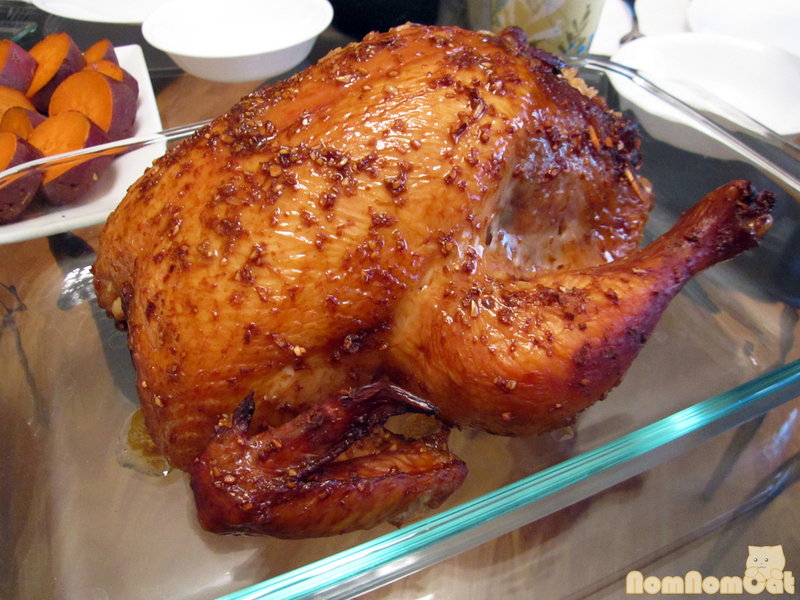 Without further ado, here goes the recipe for preparing your own soy sauce and garlic marinated roast chicken with sticky rice stuffing, a Nom Nom Cat Thanksgiving. 1) Game plan – the night before you plan to serve the meal: prepare the marinade, let the chicken do its thing, and soak the sticky rice. In a medium sized bowl, mix together the ingredients for the marinade. Muddle the garlic a bit with the back of your spoon to really get the flavors out. Evenly drizzle over your cleaned and prepped chicken. I like to peel back the skin on the breasts and make sure some marinade soaks into the meat underneath. Let the marinade work its magic overnight in the refrigerator. In a large bowl, soak the sticky rice in enough warm water to cover the rice by at least an inch. Marinated and ready for the oven! 2) Game plan – 4 hours before dinner time: Soak the dried shiitake mushrooms in a bowl of warm water and the dried shrimp in a separate bowl of warm water. Let soak for 1 hour. 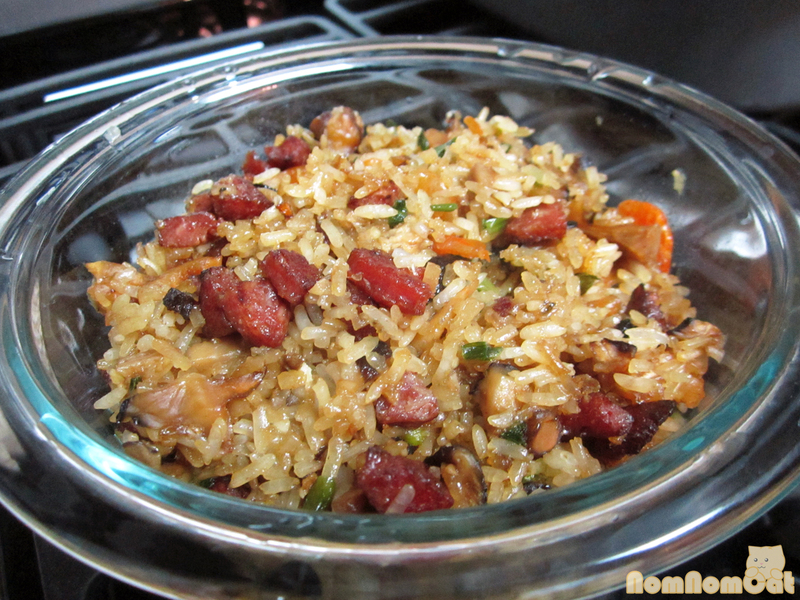 3) Game plan – 3 hours before dinner time: Prep the sticky rice stuffing. Drain the soaked mushrooms and shrimp; chop the mushrooms. In a large sauce pan, heat 1 tablespoon of oil on medium-high heat. Toss in the garlic and Chinese sausage. Fry until the cubes look toasty. Then add the mushrooms, shrimp, and seasonings. Stir to combine and add pepper to taste, keeping in mind that the rice will “dilute” the overall flavor. Drain the rice and add to the pan, cooking until the rice starts to turn brown and roasty-toasty. Mix in the green onions. At this stage, add one tablespoon of water and continue to cook on low heat until the rice becomes somewhat softened. Take the stuffing off the heat and let cool for a few minutes. 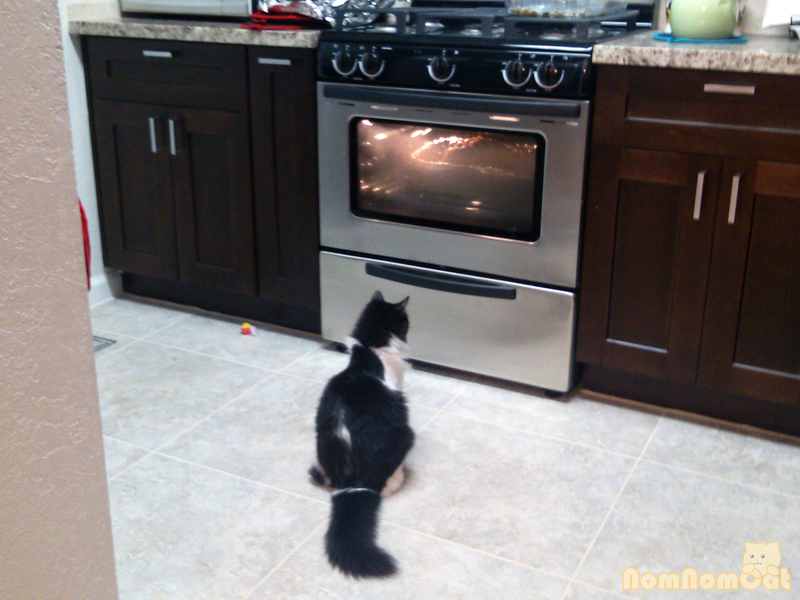 4) Game plan – 2 hours before dinner time: Preheat the oven to 375 degrees. A 4.5 lb chicken will take at least 1.5 hours to cook, possibly 2 hours. Stuff the sticky rice stuffing into the chicken’s cavity. Truss the cavity closed using long skewers, turkey trussing skewers, or put your arts & crafts skills to work with a little twine and stitching. Drizzle the remaining marinade over the top of the chicken. If you don’t have fancy trussing tools, you could try toothpicks and hope it doesn’t explode too much! 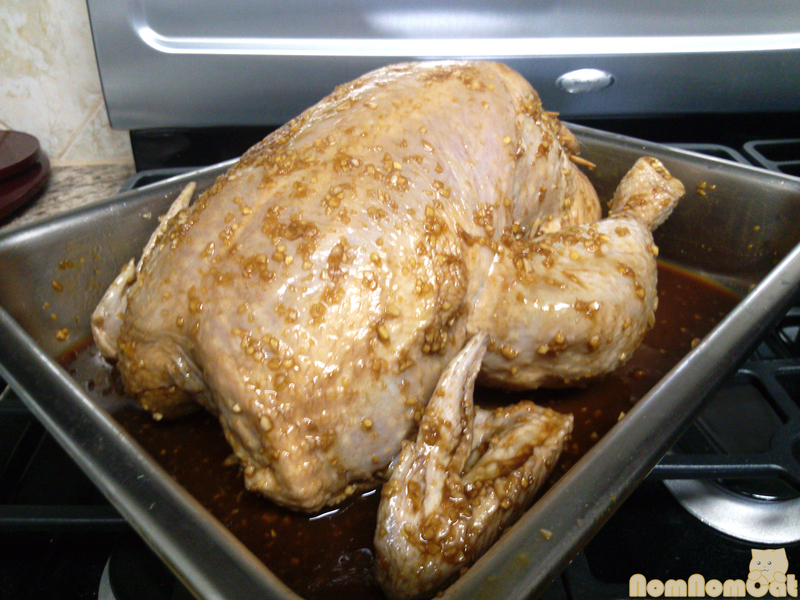 Bake at 375 degrees for 1.5 to 2 hours, or until the dark meat juices run clear. Keep a watchful eye on the chicken and if it starts to darken too quickly, create a foil “tent” and loosely cover. Cookie keeping a watchful eye on the chicken. We hope you’ll enjoy our recipe for an Asian fusion holiday dinner. You can easily scale down the marinade (or follow the recipe and save the leftovers in a jar or reduce in a saucepan to drizzle over as a glaze) to accommodate smaller chickens, chicken parts (like boneless skinless chicken breast, if that’s your thing), cornish hens, etc. This meal always reminds me of Thanksgiving but the hearty, family-style nature of the roasted poultry is appropriate for any of the winter holidays (hint: just 5 days until Christmas!) or any time of the year really! 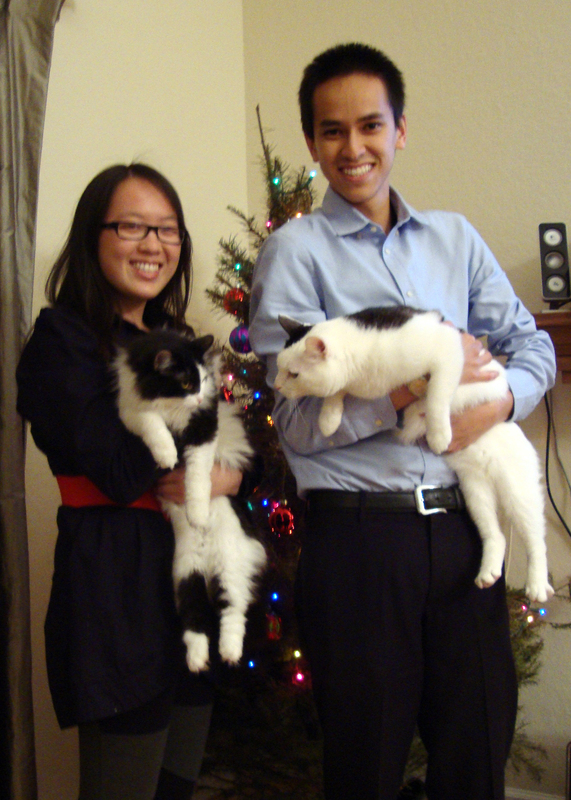 From our home to yours, we want to wish you all a very happy holiday and many good things to come in 2013!